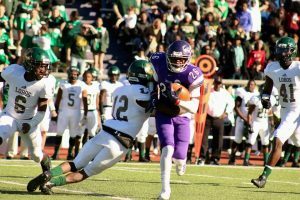 NACOGDOCHES – Playing in front of a packed houseat SFA’s Homer Bryce Stadium, the Lufkin Panthers and Longview Lobos delivered yet another instant classic in a game that came down to the final minute. Unfortunately for the Panthers, it was the Lobos that delivered a state semifinal apperance to Longview as Haynes King hit Kamden Perry for a 28-yard touchdown pass with 54 seconds remaining to cap off a wild 33-32 win in Class 6A Division II State Quarterfinal action here Saturday afternoon. After a back-and-forth game that saw six lead changes in the second half alone, Lufkin was just 2:07 away from bringing home another upset win when Isaiah Phillips ran in an eight-yard touchdown and Kewone Thomas scored on a two-point conversion to make the score 32-26. That proved to be too much time for Longview as Keilyn Williams returned the following kickoff 50 yards to the Lufkin 38. Three plays later, King lobbed a pass to Perry, who made a leaping grab in the end zone. Chris Kessler then knocked through the extra point to put the Lobos on top for the fourth and final time at 33-32. The Lobos then came up with a final interception to end the Pack’s final hopes. The finish was a heartbreaker for the Panthers, especially Phillips, who delivered his best performance in the last game of his Lufkin career. He finished the day with 245 yards and three touchdowns on 37 carries. Kewone Thomas threw for 191 yards and a touchdown on 17-of-26 passing with a pair of interceptions. Malik Jackson had five catches for 62 yards and Ja’Lynn Polk had five receptions for 60 yards and a touchdown. Longview was led by the duo that eventually gave it the win with King completing 13-of-22 passes for 179 yards and three touchdowns to go along with two interceptions and Perry making eight receptions for 115 yards and two scores. Williams added 90 yards and a touchdown on 14 carries. The Panthers controlled much of the clock in a first quarter in which they ran 26 plays but were derailed by an interception, a pair of costly penalties and an explosive Longview offense. After receiving the opening kickoff, Lufkin drove near the Longview red zone before a pair of incomplete passes forced it to turn the ball over on downs. Longview had no such problems on a drive that covered 76 yards on seven plays. It was capped off when King hit a wide open A’darius Carter for a 39-yard touchdown and a 7-0 lead five minutes into the contest. On Lufkin’s next drive, a touchdown was taken off the board due to a chop block penalty. Two plays later, Longview took advantage of that when Ja’Vontae Wright picked off a pass and returned it to its own 27-yard line. On the ensuing drive, the Panthers had an interception taken away due to a pass interference call. That helped to springboard the Longview offense, which drove down the field for a four-play, 73-yard drive that was capped with a 34-yard touchdown pass from King to a wide-open Kamden Perry, making the score 13-0 with 1:35 left in the first quarter. In the opening quarter, Lufkin eventually racked up 170 yards but had nothing to show for it. The second quarter started with another missed opportunity when a drive fizzled inside the Longview 5. However, Lufkin’s Rodrigo Molina came through with a 21-yard field goal that narrowed the gap to 13-3. After the Panthers got their first stop of the game on the following drive, Phillips got the offense rolling with a 42-yard run in which he broke a pair of tackles near the line of scrimmage. Then facing a third and 14, Kewone Thomas found an open Ja’Lynn Polk, who hauled in a 22-yard touchdown that cut the margin to 13-10 midway through the second quarter. Near the end of the first half, Longview had a big play of its own come off the board when a long King touchdown pass was taken away due to a holding penalty. In the opening half, Lufkin outgained Longview 266-193 with Phillips doing the bulk of the damage with 128 yards on 18 carries. Thomas completed 10-of-15 passes for 128 yards and a touchdown while Polk had three catches for 40 yards and a score. King led Longview with 131 yards and a pair of touchdowns to go along with 34 yards on two carries. Kamden Perry was his top target with six catches for 81 yards. The Panthers started the second half with a flurry as they hit King while he was throwing on the Lobos’ first offensive play. Savon Fields was there to finish off the play with an interception before returning it to the Longview 2. Phillips scored on the next play to put the Pack on top for the first time at 17-13 with 11:37 left in the third quarter. The Lufkin defense then forced another punt, but it was muffed, allowing the Lobos to get the ball back at the Lufkin 17. It took Longview four plays to take advantage of that mistake as King scored on a one-yard run that let it regain the lead at 20-17 with 6:45 left in the third quarter. After forcing a three and out, Longview had the chance to take a two-score lead when King had an open receiver near Lufkin’s goal line, but an underthrown ball allowed Lufkin’s Darren Woodson to make a diving interception at their own 8-yard line. Lufkin’s offense responded with its longest drive of the game, spanning 92 yards on 11 plays. Phillips put the exclamation mark on the drive with a 32-yard run, breaking a tackle at the 18 before sprinting the rest of the way. That run put the Pack on top 24-20 with 11:02 left in the game. Longview answered with a big play of its own with Jaquan Edwards returning the following kickoff 55 yards to the Lufkin 40. However, that drive ultimately ended with a 42-yard field goal that sailed wide left. That only momentarily stopped the Lobos, who came up with a blocked punt on Lufkin’s following possession. Two plays later, Keilyn Williams broke loose for a 22-yard touchdown that gave Longview the lead again at 26-24 with 7:46 remaining after the extra point sailed wide left. Lufkin’s offense still had plenty of fight left in it on a drive that went 87 yards on 16 plays and culminated with a Phillips eight-yard touchdown run with 2:07 left in the game. Thomas then ran in the two-point conversion before being hit just after the goal line, upping the lead to 32-26. However, Longview had the final plays to seal the win. With the loss, Lufkin finished its season with an 11-3 record while Longview improved to 13-1.